I’m happy to announce the release of FireBible 2.0; this version will work on Firefox versions 26 and up, on Windows and Linux. 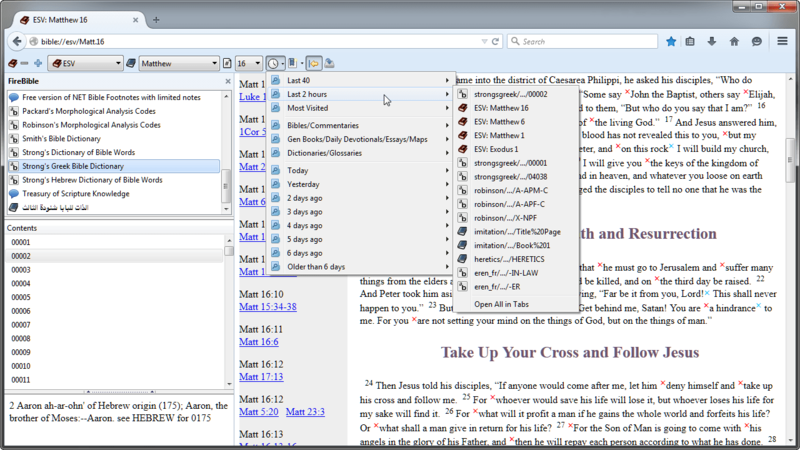 FireBible is now based on native libraries and no longer requires Java; it’s much easier to install and far more robust. If you already had FireBible installed from this site, check for an update to get the new version or just hit the FireBible page to install it. I’ll be updating the AMO version shortly, though it might take some time for this version to be accepted. Alternate versification (av11n) support. You can now read Catholic and other Bibles with versification that differs from KJV canon. Try the CPDV or DRC Catholic bibles. FireBible will download the native libraries it needs on Windows or Linux, it’s marginally faster than previous versions and much more robust (no more issues due to Mozilla’s security policies or odd Java distributions and browser plugins). Does not work on OS X, the native libraries that FireBible uses haven’t been compiled for OS X yet. No module manager, though you can install from ZIP files easily through a new Install Modules button on the FireBible toolbar. I’m working on the search and module manager, I did not want to hold up the release further because of these missing features (hence the beta tag). If you’re a C++ developer with OS X experience and would like to help compile the native libraries FireBible needs for OS X, please get in touch. Firefox kept changing their security policies as far as the use of Java in extensions was concerned and I had to keep duct-taping fixes in place that would keep FireBible working. Finally, they made a change that broke FireBible outright and there was no way to keep it going with Java; believe me, I tried. I wrote about these issues in the past and had been thinking about switching from JSword (Java library) to Sword (native library) for some time. When David Haslam pointed me to XULSword, I knew it was technically capable and decided to make the move. FireBible 2.0 has been in development for ~ 1.5 years, the fundamental change from JSword to native Sword libraries wasn’t that hard (thanks to XULSword) but most of FireBible had to be rewritten. Getting all the functionality working has taken much longer than I anticipated – FireBible is weekend work and I got married last year! It’s still far from perfect, but definitely quite usable in its current form. Any feedback would be appreciated. I released FireBible 1.4 early this morning, this release fixes issues with recent Java 7 updates and Firefox 16 and above, as discussed in my last post. I also threw in a few minor bug fixes. As usual, if you already have FireBible installed, simply check for updates (I’ll be updating the AMO version later today) . To install a fresh copy, head on down to the FireBible page. FireBible still won’t work with the IcedTea Java plugin on Linux (unless you remove almost all security settings, not recommended). So you will still need an Oracle Java installation on Linux for FireBible to work. Still no av11n (alternate versification) support as I need to wait for this to be added to the JSword library. Full support for deuterocanonical books (including the Catholic Bible :() therefore not present yet. Hopefully soon. Ubiquity support still cool (I consider this to be one of FireBible’s best features) – but you need the privately maintained Ubiquity 0.6 version or higher; you can get that here (download the file and select it in the File > Open dialog to install). No Java installation required, extension should work out of the box. Security issues keep cropping up with “Java in the browser”. There are restrictions that are either imposed by Firefox itself or changes in Java internals that affect “not so common” use of Java. Hopefully we’ve seen the last of these. av11n support already present in native Sword libraries. Will lose JSword specific UI such as the module installer and settings. Implementation will be harder and take time which I do not currently have. Will need to build separate versions of the extension for each platform (currently not required due to the use of Java libraries). Unfortunately there have been a couple of issues rendering FireBible defunct on recent versions of Firefox. I’m not too sure if this was caused by changes in Java 7 update 7 (or later) or if it was the switch to JAXP 1.4.6 in Java 7 update 4 – nevertheless, you are now forced to use a version of Java in which the above error occurs. The second issue is a change in Firefox version 16 (16.0.1 is now current) where the “java” global variable was removed. I was warned by the addons team in advance, but failed to make changes in time (however, we’d still be stymied by the above problem). The good news is that I do know how to solve both problems, but am currently looking for a better solution for the first of these. I’ll try to release a fix ASAP. This extension has always been a technical challenge, which is fun most of the time, but the battle with Java in the browser has been a PITA – it still won’t work with IcedTea due to more permission problems. I’m wondering if I should go native instead and switch from JSword to Sword, the crossover will be quite expensive in terms of time and effort, but will probably add long term stability to FireBible. A Java installation (specifically, the Oracle one) would no longer be required and we wouldn’t be plagued by these incessant security issues.